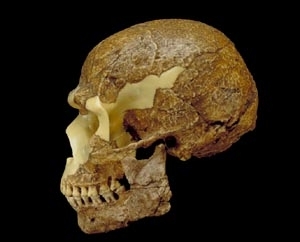 The origin of modern Homo sapiens is not yet resolved. Two extreme scenarios have been proposed. According to the first, the distribution of anatomical traits in modern human populations in different regions was inherited from local populations of Homo erectus and intermediate "archaic" forms. This "Multiregional Hypothesis" states that all modern humans evolved in parallel from earlier populations in <?xml:namespace prefix = st1 ns = "urn:schemas-microsoft-com:office:smarttags" />Africa, Europe and Asia, with some genetic intermixing among these regions. Support for this comes from the similarity of certain minor anatomical structures in modern human populations and preceding populations of Homo erectus in the same regions. A different model proposes that a small, relatively isolated population of early humans evolved into modern Homo sapiens, and that this population succeeded in spreading across Africa, Europe, and Asia - displacing and eventually replacing all other early human populations as they spread. In this scenario the variation among modern populations is a recent phenomenon. Part of the evidence to support this theory comes from molecular biology, especially studies of the diversity and mutation rate of nuclear DNA and mitochondrial DNA in living human cells. From these studies an approximate time of divergence from the common ancestor of all modern human populations can be calculated. This research has typically yielded dates around 200,000 years ago, too young for the "Multiregional Hypothesis." Molecular methods have also tended to point to an African origin for all modern humans, implying that the ancestral population of all living people migrated from Africa to other parts of the world - thus the name of this interpretation: the "Out of Africa Hypothesis." Whichever model (if either) is correct, the oldest fossil evidence for anatomically modern humans is about 130,000 years old in Africa, and there is evidence for modern humans in the Near East sometime before 90,000 years ago.